Capitol Subaru is proud to offer residents of Salem, Four Corners, Keizer, and the West Salem Oregon area special discounts for Genuine Subaru Parts. 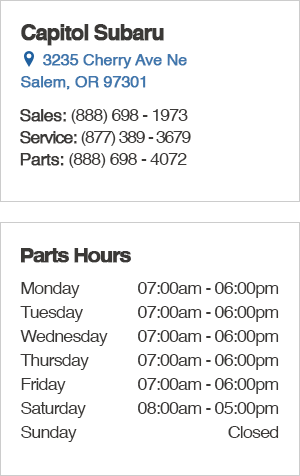 Our Parts Department carries a wide variety of all the latest OEM parts and accessories for your Subaru vehicle. If you need help finding a specific part, or want to know more about performance and style enhancements, our friendly and knowledgeable parts specialists are experienced and will find you exactly what you need. We encourage all our customers to browse our online parts eStore and parts specials webpage for extra savings in our parts department located at 3235 Cherry Ave Ne, Salem, OR 97301. If you have any questions please do not to hesitate to give us a call at (888) 698-4072.